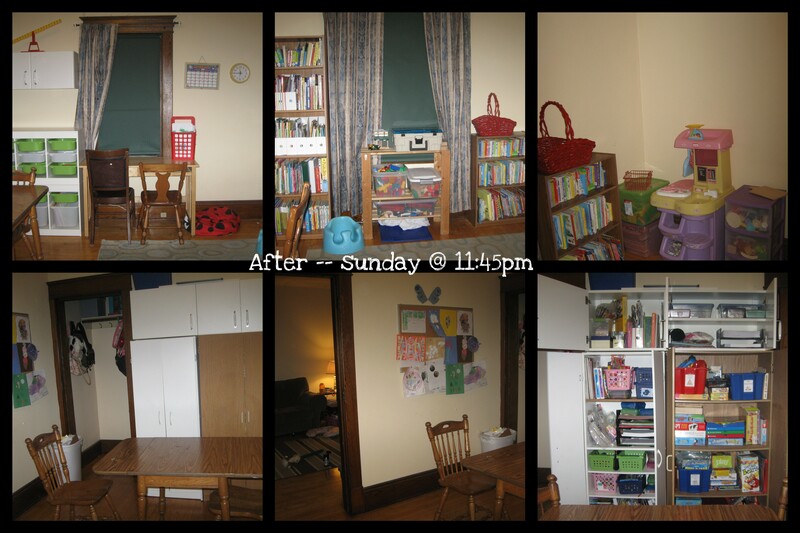 With Miss M’s room finished, the next job on our to-do list was to re-do the play/school room. With Mr. E moving toward spending more time on school work and having more school supplies, and thinking toward Mr. K even doing some preschool type work next year, our set up needed some tweaks. Add that to the fact that the boys now have a new “road” rug for their cars and have been taking more and more toys to their room anyway, it seemed like a good time to move more of the boys toys (especially ones that cause loud, noisy play) to their room. The school room is mostly finished. While there are a few toys in there (and we’ll need to add in some baby toys as J is getting older and more interested in toys! ), we wanted the focus of that room to be quieter activities: schoolwork, crafts, games, reading and building play like legos and blocks. We have a few more bins that may go in the closet (that area is not quite finished yet). We also have plans to repurpose an old VHS rack into a book case that would allow for books to sit with their covers facing out. We need to add to the walls the world map that Miss M received for Christmas, and maybe another bulletin board. And now I have to re-organize the toys we just put in the boys room! They aren’t in too bad of a state, but it definitely needs work in there. 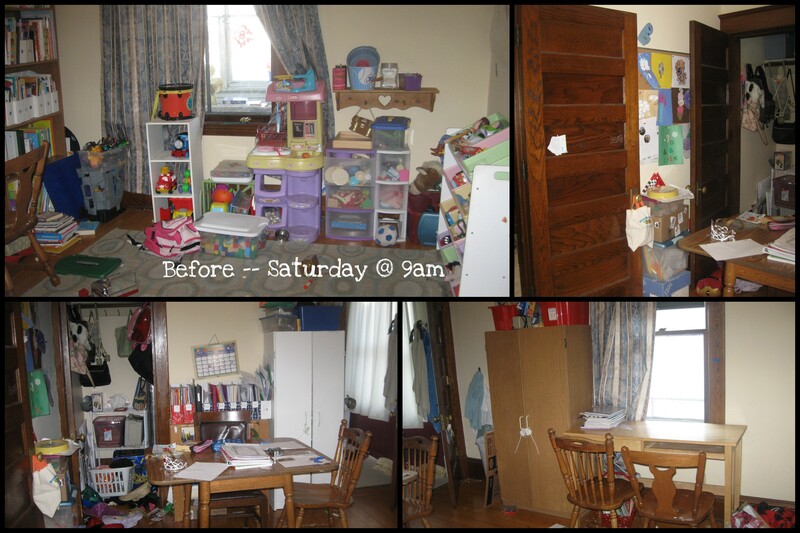 After it was done, I sort of felt like a person on one of those cable shows where they redo an entire house in a week. I can’t wait to use our new school room today! 1. Weekly library outing. The book that Miss M and Mr. E are looking at was one of our favorites this week! 2. We made it to the geometry/drawing tools lessons in RightStart Level C this week. While I have read many reports of frustration and tears surrounding these lessons, the first two lessons using the drawing tools were met with joy by Miss M and only a few mild frustrations. I was so pleased that we were able to complete 5 lessons this week (that doesn’t happen to us very often — we usually only get 3 or 4 done). Miss M actually told me she hopes the drawing tools lessons are harder next week! 3. It was book report week at our homeschool co-op for Miss M. She chose the Boxcar Children book entitled “Treehouse Mystery” for her report. She started out writing the report by hand, but quickly got frustrated with spelling issues and her struggles to write neatly on the small lines in the notebook she chose to write in. Since time of was of the essence (aka, we actually had a deadline! ), I allowed her to dictate to me and I typed the report for her. This reminded me, however, that it had been my intention of finding a new writing curriculum to start in January. I guess I didn’t quite meet that goal. I think Miss M definitely needs more instruction and practice in the writing department. 4. Gotta love a game of War first thing in the morning…while still in jammies! 5. Cute baby J picture, taken by Miss M…just for fun! 6. The boys working on mazes in a new workbook I bought a few months ago…and just re-discovered while moving the contents of our office to make way for Miss M’s new room. 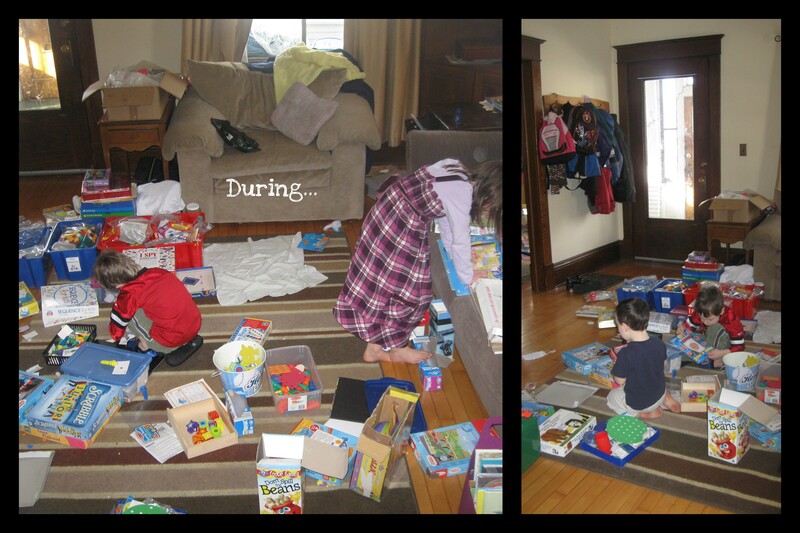 Miss M is working at the desk in the background…and the play/school room is a mess, as usual! 7. Mr. E has been begging me to work on reading again with him. He was showing more interest in reading “real books” rather than working on lessons from Phonics Pathways. So, I pulled out our “Now I’m Reading” books by Nora Gaydos, as well as a series of phonics-based readers I printed out (and bound with book rings) when I took advantage of a free trial of readingatoz.com a few years ago. Mr. E read 4 small books with me this week. Yeah! 8. I bought subscriptions to readingeggs.com for both Miss M and Mr. E through two different deals last fall. Mr. E is working on basic phonics/reading lessons, while Miss M is working on spelling and reading comprehension. It’s a great website that uses a lot of fun little games to teach language skills. I would not probably pay the full price they typically charge, but over the years (starting when Miss M was about the age Mr. E is now! ), we have had various free and discounted subscriptions that have proven to be fun and worthwhile. The kids hadn’t gotten to do reading eggs since before Christmas, and since I paid for those subscriptions, I thought we should get back in the habit of using them! 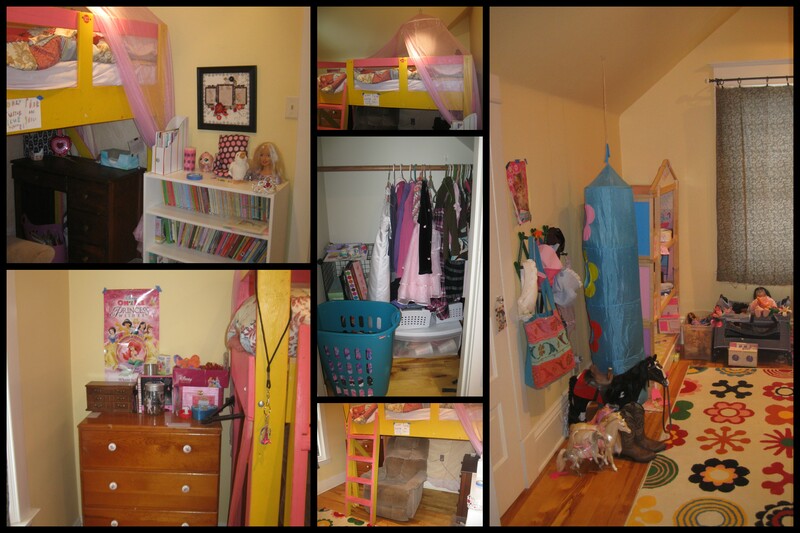 And last Saturday, we did get Miss M moved into her very own room. We’re all very pleased with the results and Miss M “celebrated” by having a friend over for a playdate on both Monday and Friday! 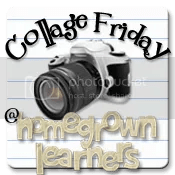 I’m linking us this week to Collage Friday @ Homegrown Learners and the Weekly Wrap-Up @ Weird, Unsocialized Homeschoolers! Miss M and I finished Ginger Pye by Eleanor Estes a few days ago. This Newberry Award-winning story tells the story of a family and their very smart pup named Ginger. Mystery and intrigue surround Ginger from the time he is purchased as an “unsavory character” seems to be spying on him and his master, Jerry. Ginger soon goes missing, presumably stolen by the unsavory character. While the overall premise of the book is that of a mystery story (and Jerry, along with his sister Rachel, go to great lengths through the book to investigate what might have become of Ginger), there are also a lot of little vignettes that give back-story and depth to the characters. I had mixed feelings about this as I read. On one hand, these little sub-stories were often funny or cute. On the other hand, I found myself thinking, “just get to the point already”. I really wouldn’t have missed many of them. Overall, Miss M and I definitely enjoyed Ginger Pye, but I have enjoyed many of our other bedtime read-alouds from the past few months to an even greater degree. Our new bedtime read-aloud is The Saturdays. We’re three chapters into that one, and so far I am liking it a lot! I’m not sure exactly which book was Mr. E’s favorite this week, and Mr. K spent the week asking for “Chuggington” and “Cars” books again. But hands down, my favorite picture book we read this past week was 11 Experiments that Failed by Jenni Offill. This book is hilarious. In this story, a curious young scientist tries out some interesting theories, with even more interesting results. Everyone in our family was laughing at this story. Kids who are fans of Mo Willem’s Elephant and Piggy books would probably also enjoy I’m a Shark by Bob Shea — the style is a bit similar. This one had the boys and I laughing a lot too. It features a shark with some attitude who might, just might have some issues with spiders. I really liked the illustrations in Road Work Ahead by Anastasia Suen. The text was pretty average — a simple story in rhyme about various kinds of road construction. But the pictures were so cute I was actually distracted from the text as I tried to spot various animals that appeared on most of the pages. My favorite — a chicken who peeks out behind a pole where a “lost pet chicken” sign is posted and is seen on a later page “crossing the road”, of course! This will be the first in a series of posts on the curricula we’ve discovered that works for us! We are currently in our second year of using Mystery of History as the spine for our history studies. After spending the fall of Miss M’s Kindergarten year reading a fairly boring early elementary history text, I knew I wanted to look for something different. While I have been intrigued by curricula that put the focus on literature, I really wanted a spine that was interesting enough and informative enough to stand alone if we didn’t get to other readings. I also was looking for something that would allow for a study of ancient, medieval and potentially some of Renaissance world history at a 1st-2nd grade level. I decided that Mystery of History (MOH) would be a good fit for us, because it fits those criteria, and has the added bonus of coming from a Bible-believing Christian perspective. MOH can give a very good introduction to world history just through reading the text. This curriculum can really hit at any ability level (or time availability level! ), with timeline suggestions, quizzes, suggested activities for each lesson for three different age groups, and suggestions of additional reading, videos or websites for nearly every lesson. Miss M and I studied Volume 1 of MOH last year — Creation to Christ. While we diligently kept up a timeline for most of the year, we gave it up about 3/4 of the way through, when our printer started having trouble with the thick paper I had chosen for the timeline. I still have a bunch of colored in timeline figures floating around in my house somewhere that never got glued on to anything. Lame, I know. We didn’t do very many extra readings or suggested activities, but Miss M seemed to enjoy most of the chapters of the text, often asking me to read “another chapter, please?!?!”. The author, Linda Hobar, does a great job of making history interesting and relating it to a Christian perspective. Having made a projected history/geography schedule for the upcoming years for our family, I decided I wanted to do American History when Miss M is in 3rd and 4th grade. So, what to do with 2nd grade? I decided we would go through all of MOH volume 2 (Early church through the Middle ages) and part of MOH volume 3 (The Renaissance), aiming to get up to the point in Vol. 3 where most American History curricula would pick up time-wise. We started MOH 2 last July, reading 4 lessons per week through the 1st quarter of the book, then dropping down to 3 lessons per week to allow for more supplemental reading once we reached the Dark Ages/Middle Ages. Why the different paces? Honestly, because I love the Middle Ages (my favorite time period in history!). I decided not to even try a timeline this year — Miss M doesn’t seem to miss it, and we’ll try a timeline again when we study these time periods when she is older. We’re on track to finish Volume 2 in mid-February. We’ll read 3 chapters per week of Volume 3 through May, and then most likely take a break from history for the summer. I’m still undecided about what materials we’ll use in our study of American history next fall. Mystery of History is a great curriculum choice for families looking for world history from a Christian perspective. It can fit with the classical model of a four year history cycle (though the 4th volume is still in development), or it can be used flexibly with longer or shorter history cycles. I made a planning chart for our studies this year, including supplemental readings and listening (we didn’t quite do all of what I planned so far, in case you were wondering). Get the file at Google Docs. I’ll be adding planned readings for Volume 3 sometime in the next couple weeks. I also made a list at World Cat of some of the supplemental books I planned for this year (again, we did end up skipping a few of these). Again, I haven’t added books corresponding to Volume 3 yet. If you aren’t familiar with WorldCat it is a resource well worth checking out — WorldCat searches for books in libraries around the nation. Set a favorite library, and you will quickly be able see if your local library holds a particular item, or if you will be able to get it from a nearby library using InterLibrary Loan. 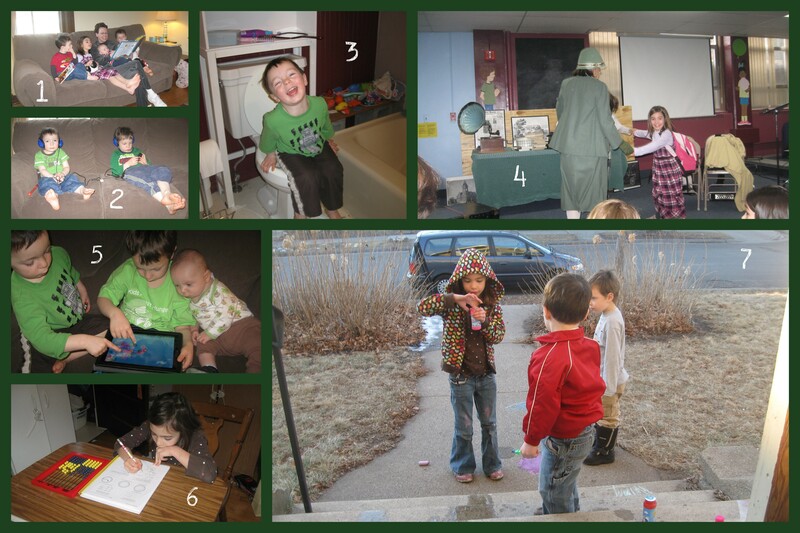 1 & 2: We had a “math games week” this week. When I looked at the upcoming lessons in Right Start C at the end of last, I noticed that we were scheduled for two lessons to learn new games, followed by a review lesson with suggested games. We played games for math each day M-Th — Short Chain Subtraction Solitaire is the game in both pictures. We intended to play a game today too, but the review sheet took longer than expected. In #2, even Mr. E got in on the act of helping with the game. He is what some people might call “mathy.” I have never really taught him anything about subtraction, but somehow he figured out the answer to a bunch of problems, or could figure them out with a small hint. He begged for a Right Start lesson of his own today, and we ended up breezing through about three lessons of level A, after not doing any since well before Christmas break. I feel bad about rarely doing a lesson of Right Start with him…but he seems to be learning plenty of math whether I do the lessons with him or not. 3: Miss M, hard at work in her spelling workbook (we are using “How to Spell” book two and “How to Teach Spelling”….sort of. I am not sure I am quite using it as designed). The desk is a new addition to the play/school room. Miss M seems to like it as a new spot to work, especially if she is allowed to stand at the desk and work without a chair! 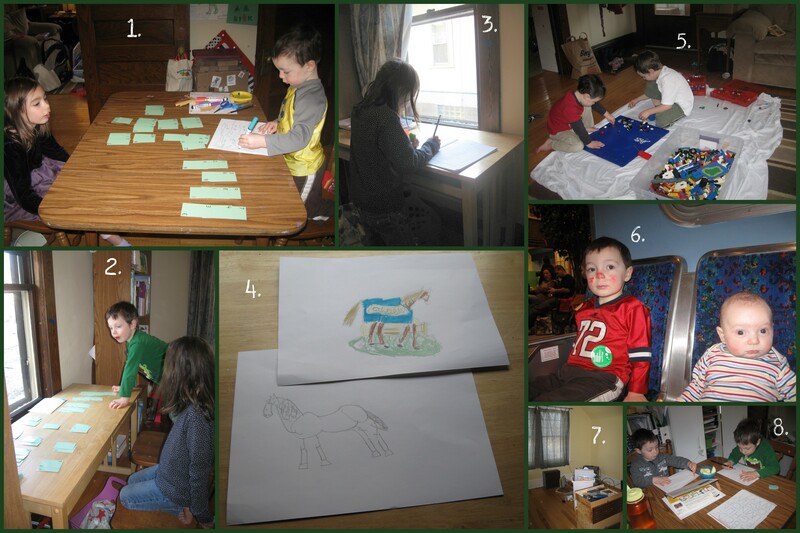 4: Miss M loves horses and loves to draw pictures of them. Aren’t they great for a 2nd grader? I think she can probably draw a horse better than I can! Miss M found several horse books at the library this week. She is reading them for fun, but some of this reading I’m sure will benefit her “Expert Day” project at co-op later this spring. (Expert Day is sort of like a science fair, but the projects can be on any topic.) She declared months ago that her topic would be horses! 5. The boys totally love Legos. 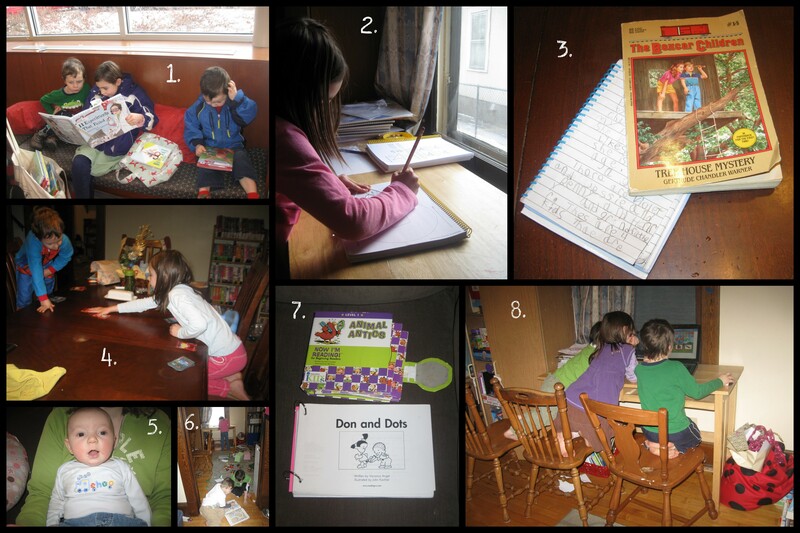 This was what they were doing several days this week while Miss M and I did school. Daddy discovered a bunch of his childhood Legos during a recent basement clean-out project, and those Legos joined our recently-organized collection on Sunday afternoon. 7. This nearly empty room means…Miss M is about to get her very own room. As soon as we gave her the news this past summer that her new sibling would be a brother, we tried to soften the news by telling her she would eventually get her own room (she currently shares with the two bigger boys). While we originally thought it would not happen until Baby J was old enough to move in with his brothers and out of Mommy and Daddy’s room, we decided it was time to move her sooner rather than later. Our old office room is getting cleared out and items moved elsewhere in the house (hence the new desk in the school room), and “moving day” is scheduled for tomorrow! Today we finished another read-aloud for history — In the Time of Knights by Shelley Tanaka. Mr. E listened to most of this one along with Miss M. It’s the story of William Marshal, a knight who was declared at his burial to be “the best knight who ever lived.” The book follows him from a childhood an under-valued younger son, to him making a way for himself as a young man, to his adulthood as he served various kings and learns about the virtues that embody a great knight. For a picture book, I was surprised by the somewhat graphic descriptions of various injuries and deaths. Miss M, also to my surprise, did not flinch at these descriptions. But if you have a sensitive child, this book may not be the best choice. There are a number of boxed-off pages that break from the flow of the story to give additional information relevant to the story on topics such as Eleanor of Aquitaine, the Crusades and the Knights Templar. We skipped these pages as most of them duplicated topics we’ve read about in Mystery of History Volume 2. We read the book in two sittings over the course of two days, but you could easily spend a lot longer with this book, exploring the many topics it brings up about the late 12th and early 13th centuries in England and Normandy. After mutually deciding to give up on Little Women, we decided to start Ginger Pye by Eleanor Estes. While I wouldn’t say it is one of my favorite read-alouds we’ve done this year, Miss M seems to really like it and I do think it is a cute story so far. We’re about half way through, so I am sure to have more thoughts once we’ve read the whole thing. Mr. E picked out three different books from a series called “Easy to Read Spooky Tales” from the library – Don’t Walk Alone at Night, Don’t Open the Door and Don’t Go Into the Forest. These stories seem designed to both entertain and teach safety lessons at the same time. I was worried they might be a bit too scary, but even Mr. K stayed to listen to all these stories. I guess they are just outlandish enough to not be TOO scary. The final page of each book explains the origins of the stories — they are all based on folktales or myths from various countries around the world. I see on Amazon there are several more books in this series, so I have a feeling we’ll be reading more of these. Mr. K is on a train kick again. We had a book based on the “Chuggington” TV series that went back to the library on Wednesday. I was not sorry to see this go back, since I think I had already read it to him about a dozen times. I think a couple pages were possibly even missing in the middle of this well-loved library book, but that didn’t bother Mr. K a bit. While at the library, he looked and looked for another Chuggington book, but a quick check of the catalog revealed that none were going to be found on the shelves that day. He was disappointed, but took a Thomas train book instead — which we have already read three times in the past two days. Mr. K’s birthday is coming soon, and I think I see more train books in his future. 1. Grandma Karen visited one day this week. Here she is reading “Little Man in the Map” to all the kids. Miss M will participate in a Geography Challenge at our homeschool co-op in May, and the challenge for the 2nd graders is to memorize the location of all the US states. Miss M wanted lots of prep time, so we started this week! We’ll be using this book as well as a few iPad apps (and standard blank paper maps) for learning and practice all semester. 2. Mr. E and Mr. K relaxing on the couch with a bit of music on a shared MP3 player today. Sometimes music is the best thing to soothe the savage beast…or stir crazy little boys as the case may be! 3. Mr. K is potty training. He’s our “class clown” so it makes life interesting. He is just as likely to do as pictured (or jump in the empty bath tub, or run right past the potty into the next room) as he is to execute the act of pottying appropriately. We still have lots of work to do in this department, so I am planning on just as many interruptions to our school day next week as potty training continues! 5. It’s not uncommon for Mr. E and Mr. K to have some time to play games on the iPad during our school day. I set Baby J down on the couch next to them for a moment, and he quickly leaned in next to Erik to see what was going on. So cute! 6. Here’s Miss M hard at work on her RightStart Math level C lesson. We completed three lessons this week. This included spending a fair amount of time reviewing subtraction strategies on Monday and Tuesday that may have gotten a little rusty over break. 7. This was perhaps the top highlight of the week — 50 degree weather on Monday and Tuesday. In January! In Minnesota! The kids were asking why we had no bubbles or chalk or jump ropes handy (Hmmm…maybe because it is really still winter? ), so I was kind enough to dig some out from the basement. Reality returned on Thursday and Friday with some more seasonably cold temps. But this is still a very warm winter by Minnesota standards — I don’t think it has gotten below zero yet.